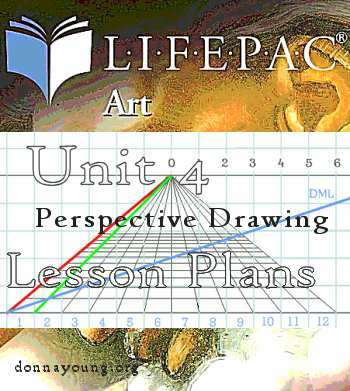 Lifepacs Elective Art Unit 4 is published by Alpha Omega Publishers and it is a unit in the 10-unit Elective Art package. Each unit can be purchased separately or as a set. Unit four is about perspective drawing and this article is about unit four. Materials needed for this class consist of the typical drawing class items, paper, pencils, erasers, a place to draw (drawing surface) and for perspective drawing, your student will need a long straight edge -- actually the length depends on the paper size that you plan to use. The size of the drawing surface should also factor into the decision. If using small paper such as printer paper or 9 x 12 inch paper, then a 12" ruler should be okay. Larger paper will need a longer ruler or a straightedge. 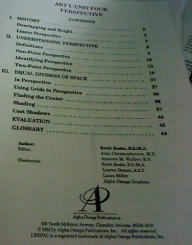 And of course, you will need the book Lifepacs Elective Art Unit 4. Will you need the teacher's book? If you do not plan to use any of the other 9 units from AOP Elective Art, then you probably will not need the teacher's book. You will have to grade the four tests without the benefit of the answer keys, but it's not that hard. If you plan to use several of the units from AOP Elective Art, then I recommend getting the teacher's book. The Lesson Plans: The lesson plans that I wrote below are minimal lesson plans and that means the lesson plans are written for the one workbook Lifepacs Elective Art Unit 4. I, personally, use additional resources when teaching a class and you are free to add more classes and use resources if you think it is necessary or if you want to spend more time on the unit. I have listed a few resources at the bottom of this page. In the lesson plans I have assigned 17 class-time drawings. I consider every drawing assignment listed necessary. Drawing class is not a reading class and the student must have the benefit of actual class-time drawing. The instructor needs to look at the students' drawings and offer feedback. Evaluating the drawings for this class is not difficult. The book has an example of just about every single drawing that the students will do. Compare the students' drawings to the examples - parallel lines that are supposed to be parallel to each other should be parallel; vertical lines should be vertical; lines that are supposed to intersect, should intersect at the right places. Offer feedback, invite dialog about the work, don't leave your student flapping in the wind. Time Estimate -Set aside a fifty minutes to an hour for each class. When I taught a more advanced perspective drawing class, I created this printable for use in class. Blue Grid. For reference, the blue grid is used in most of the models. I have all of the books linked below and my opinion (not given) varies with each book.